Learning how to improve your life in many ways can be easier than you think when you understand how the Law of Attraction works and practicing it in your everyday life. Sure, you might have heard some things about this interesting law, some positive and maybe some negative, but I’m here to tell you that whatever you think about it, it’s very real and it affects everybody whether they believe in it or not. Think about it like this: Gravity is a very real thing, but you can’t see, hear, smell, touch or taste it. You know about it because you read about it somewhere or you learned about it at school. You know that gravity attracts everything to the center of the earth and if you fall off a high building, you’re going straight down whether you believe in it or not! Just like gravity is a known and fairly well understood law of nature, attraction is also a natural and measurable law that works on the principle of the vibration of energy. Thanks to advancements in technology in the last century or so, our physicists understand atomic structure and that everything in the known universe is made of energy. Energy is a vibrating, pulsating form that is everything. Even what we see as solid matter, when viewed in the most powerful electron microscopes can be observed as a pulsating, moving, energetic form of multitudinous elements of atomic energy. All that energy vibrates on a multitude of different frequencies, depending on how it comes together to form the different types of matter that we can see, hear, smell, touch and taste. That includes waveforms such as visible (and invisible) light, sound, radio waves and other waveforms that exist. Here’s the kicker. Even our thoughts are made of energy because they are a type of waveform that we are now learning how to detect and measure. Since our thoughts are mad of energy and vibrate on certain frequencies depending on what we are predominantly thinking about, it is a little easier to understand that we all have, in our power, the ability to shape and change things. How? We have the power to choose our thoughts. That’s how! What we are thinking affects our emotional state. Our emotional state affects the vibration that our bodies are in (or the energy that makes up our bodies). The vibration our bodies are in dictates our actions. It’s our actions that create the lives we lead, whether they’re happy, productive, prosperous and healthy or they’re sad, unproductive, poverty stricken and unhealthy. What actions are you taking each day and how are they affecting the quality of your life? The big takeaway from the Movie “The Secret” which deals with the Law of Attraction is that we attract to us the things that are in harmony with us at any given moment. If we are happy, we attract happy people and situations to us. If we are angry, we attract angry people and situations to us. That’s pretty easy to understand once we understand how the physical laws of energy and frequency of vibration work on a day to day level as I just explained briefly above. The message that the movie doesn’t do such a great job of getting over to us is that it takes more than just wishing for a situation to manifest in our lives for it to actually manifest. The movie relied on people’s desire for an easy solution to raise awareness of the Law in as many viewers as possible, but in my opinion didn’t stress heavily enough the need for a person to go beyond just imagining a thing and then it turning up on the doorstep next day. 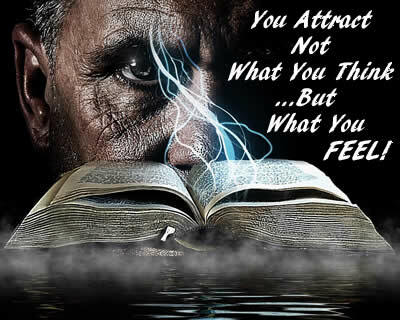 Of course, you need to be in the right vibration to attract the good you desire into your life. You also need to boost that attractive force by taking the necessary action to bring it about. You do that by being in the right emotive state! This article is fairly concise, since the subject is so vast it would take a whole book to really do it justice. I really don’t have the time to do that when there are so many books already written and courses available to take to get that information. For example, you can even train to become a certified law of attraction practitioner by following that link and reading about a great course created by one of the guest speakers in The Secret movie, Dr. Joe Vitale. Or you could simple visit the website: and read a lot about how this all works and why we do what we do and get the results we get. I hope this article has peaked your curiosity to learn more about this fascinating law of nature that is really only just beginning to catch on to a much wider audience than it did in years gone by. Then you could even put it to use in the right way to improve your life in many areas in the ways you want it to improve as you choose. Life is really a choice and we usually get what we choose (mostly), without really giving much thought to how it all came about. Now you can change that and by your very thoughts, change the way it is to the way you want it. Is that not just amazing? You may be shocked to know that something like 70 million people choose to start a weight loss diet of some description every year in this country. Even staggering is the sad statistic that around 95 percent of those hopeful dieters will actually fail to find a long lasting solution to their weight problem. How can this be when modern diets are so sophisticated and benefit from many years of careful studies and research into the best ways of eating to manage weight? One of the reasons so many people who diet to lose weight either fail to lose it or end up gaining back what they did lose soon after they stopped dieting is instead of continuing with eating a healthy diet, they reverted straight back to their old bad eating habits. And so the weight returned. One way to avoid this happening is to diet with confidence and to keep the actual diet going for much longer than the prescribed period of time recommended by the diet itself. That doesn’t mean to stay eating the same diet foods, but by maintaining the level of calorie and portion control set out by the diet itself. That way, you don’t end up going back to your old eating ways but instead keep a healthy way of eating that becomes the habit over time. When this happens, you actually change your bad habits for good ones and because the healthy way of eating becomes the norm or the habit, you find you don’t miss eating all the bad stuff that caused you to gain weight in the past. It’s a pretty good way of reframing your mindset to accept a better way of eating that is for your benefit long term. Once you can keep this habit going, you need never put on any weight again because your body won’t be craving those old bad foods any more. While the main aim for anyone wanting to improve their overall health and fitness levels is to eat a healthy diet while working with a good exercise program on a daily basis, there are some people for whom that kind of system will not be possible. These are people who work long hours and have little time to themselves. But there is a way to get around this and that is to take advantage of the convenience variety of diets that are available. While relying on diet alone to improve health is really only part of the overall equation, it is a start in the right direction. This is especially so if the person has been living on a bad diet of processed and junk foods. Reading a review of Nutrisystem or one of the similar diet programs, you will see that you can get all your meals delivered to your home and not have to spend any time cooking meals. This time saving aspect of these diets is the key to helping you get back on the road to better health and fitness, because the time you save in not having to prepare and cook food, you could devote to getting some exercise into your day. This will not be suitable for everybody in this situation, but it will mean that when you get home from work, instead of spending time in the kitchen preparing your evening meal, you could grab a 30 minute workout to a home fitness DVD or dance to Zumba or something similar before sitting down to eat a microwaved meal. It’s not a perfect solution but its one that is better than no solution at all! How Effective are Convenience Diets? When you are thinking about losing some weight through diet and are looking at the alternative that are available to you, it will probably seem natural to wonder about the validity of certain types of diet. Some of the diets that are available commercially seem to promise much yet are geared to the busy person with a tight schedule and are designed to be as convenient as can be. So how can they be as effective as working on your own diet plan and putting in the time and effort that these convenience diets seem to allow you to do without? The answer is not a simple one, but it helps to understand what this type of diet is all about and who its main target is. Convenience diets such as those provided by companies like Nutrisystem are designed to be simple and for the user to have as little to do as possible. They are targeted to people who have difficult work schedules that leave them very little time for looking after what they eat. This means they often tend to grab a quick lunch that is invariably mainly junk or empty calories bought at a fast food restaurant or a ready to eat snack off the supermarket shelf such as a sandwich or similar. What a convenience diet offers is a healthier and low calorie alternative to grabbing something quick in a store, that can be quickly brought to the plate and eaten at home or taken to the office even and eaten there. They restrict your calorie intake while providing ready, fast and relatively tasty healthy meals, which is a big improvement on what they were doing before. So from this perspective, it is easy to see how important such a diet is to a certain group of people and to them, it is certainly a valid diet that will help them to lose weight or at the very worst will stop them gaining any more! So if you ever wondered if a product like Nutrisystem or Medifast really can help you lose weight then the answer is: Yes it can! If you are not one of those people who lead such busy lives, then perhaps you will have more time to explore other more suitable alternatives that fit with your own personal circumstances. Getting this part right about your own diet is the important part and can mean the difference between success or not. Green Video, Proudly powered by WordPress.